About a decade ago, I accidentally launched into a sub-hobby of genealogy -- one I refer to as orphan heirloom rescues. The idea is to return items to descendants of their original owners. I discovered that our stuff has an amazing ability to wander, and not surprisingly, it often winds up with complete strangers. If we're lucky, these strangers are the kind who just can't bring themselves to toss family history treasures even when they have nothing to do with their own family. But after a while, the photo, bible, bridal book, military medal, engraved silverware or whatever starts to give the caretaker a guilt complex. They have good intentions, but they're busy, and just how do they get it to someone who cares anyway? That's where I come in. I'm a hybrid genealogist who's as skilled at finding the living as the dearly departed, so I whipped up a submission form on my website and the orphans started rolling in. Then I started writing articles about the rescues detailing the steps I took to track down the family of origin and the happy reunions that ensued. Unfortunately, the magazine I wrote them for folded last year, but if you're curious, you can find a number of them digitized in Google Books. When the magazine breathed its last, I decided to take a break, but now the itch is back, so I've decided to start rescuing orphan heirlooms again. If you have someone else's family treasure you'd like to return to an appropriate individual, please share the details here. I can't tackle all cases I receive, but I'll periodically select one, do some detective work, and share the results here. 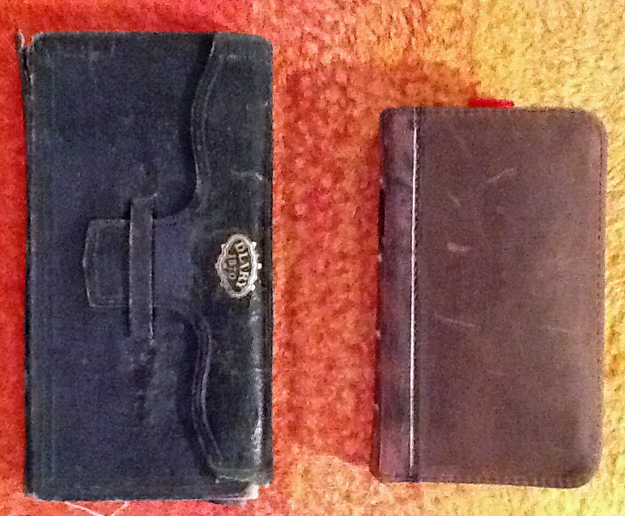 The first one up will be this 1870 diary of an Irish immigrant that I couldn't help but notice looks a lot like my iphone bookbook (plus ça change, plus c'est la même chose!). Check back soon to hear its story.